Now in its 11th year, the Samford Arts faculty gala serves as the official opening event for the School of the Arts. This year’s event is Sept. 12. Faculty, students and friends gather to share faculty talents and thank Friends of the Arts for their generous contributions to the arts program. This year’s gala is sponsored by Patty McDonald, a longtime donor to the School of the Arts. The evening begins with a reception from 5:15–7 p.m. in the Samford Art Gallery. The opening exhibit, Between the Shadow and the Light: An Exhibition Out of South Africa will feature a cross-cultural visual arts project which took place in South Africa in 2013. Two Samford faculty members, Joe Cory and Larry Thompson, participated in this event and share their work as part of the exhibit. Showcasing the depth of faculty talent, the gala is at 7:30 p.m. in Brock Recital Hall. 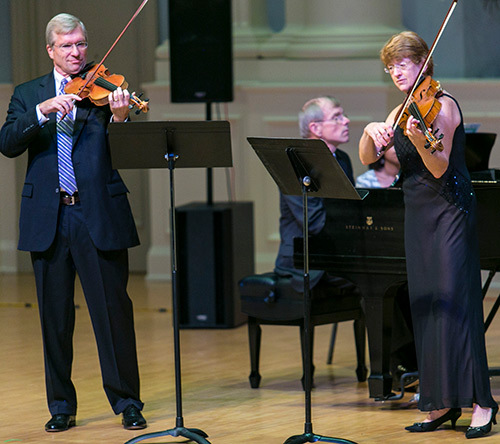 Highlights will include the Samford String Quartet, recently retired faculty member Don Sanders and collaborative performances by more than 15 music faculty members. A post-performance reception will follow in Boren Courtyard to honor Friends of the Arts.